PHILADELPHIA (WPVI) -- An American Airlines flight was delayed at Philadelphia International Airport on Tuesday after a report that a banned phone was on brought on board. 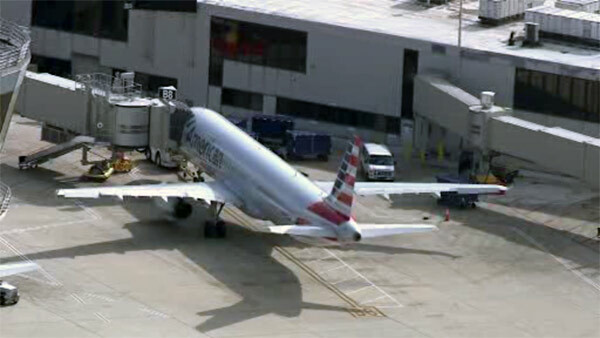 Flight 2051 was supposed to depart Philadelphia for Miami shortly before 10 a.m. Tuesday. However, the captain ordered the delay after a report that a passenger brought a Samsung Galaxy Note 7 on board. That phone is banned on U.S. flights, and was pulled off the market by Samsung because of a risk of fire. A passenger tells Action News that all passengers were taken off the plane to be re-screened in an effort to determine if anyone was in possession of such a phone. However, no phone was found and passengers are being let back on board.